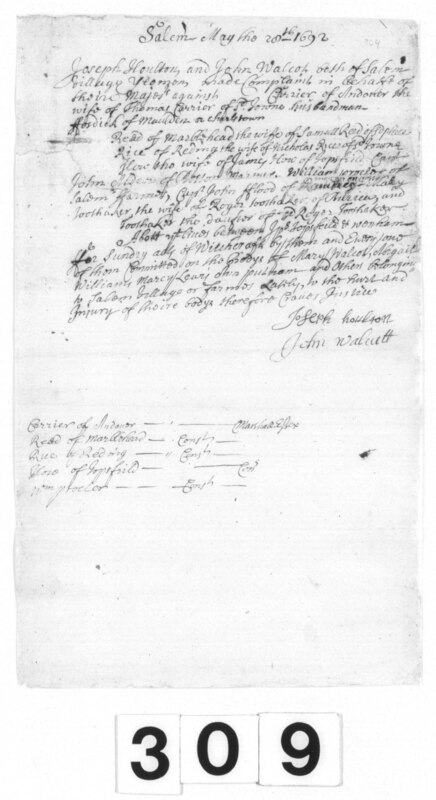 Complaint of Joseph Houlton & John Walcott v. Martha Carrier, Elizabeth Fosdick, Wilmot Redd, Sarah Rice, Elizabeth How, John Alden, William Procter, John Flood, Mary Toothaker, Margaret Toothaker, & Arthur Abbot. Source Citation Essex County Court Archives, vol. 1, no. 309, Massachusetts Supreme Judicial Court, Judicial Archives, on deposit James Duncan Phillips Library, Peabody Essex Museum, Salem, MA. Records of the Salem Witch-Hunt (2009) No. 221: Complaint of Joseph Houlton & John Walcott v. Martha Carrier, Elizabeth Fosdick, Wilmot Redd, Sarah Rice, Elizabeth How, John Alden, William Procter, John Flood, Mary Toothaker, Margaret Toothaker, & Arthur Abbot.